The definitive solution to attract fish right up to your hooks. Thanks to its adjustment system and weighting possibilities, this innovative product adapts to all types of tides and waves, different types of pastes, and your chumming preferences. Paste dispensing is automatic, constant, adjustable, and released right next to your tackle. Handling is simple and clean, with versatility that helps every angler get the most out of their fishing day from the moment they set off. 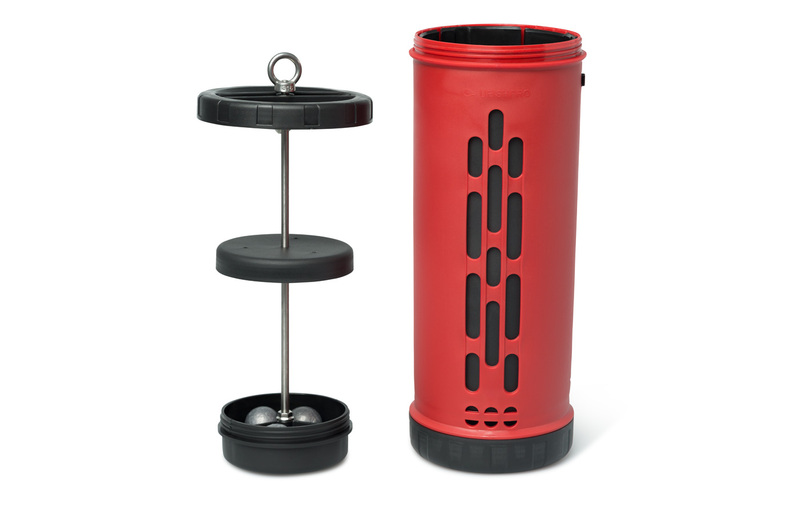 How do you use the UFISHPRO chum dispenser? • Remove the lower cap (1) and put weights* in the compartment provided or, if there are strong currents, hang weights* from the ring (2). • Unscrew the top cap (7) to remove the plunger (8). 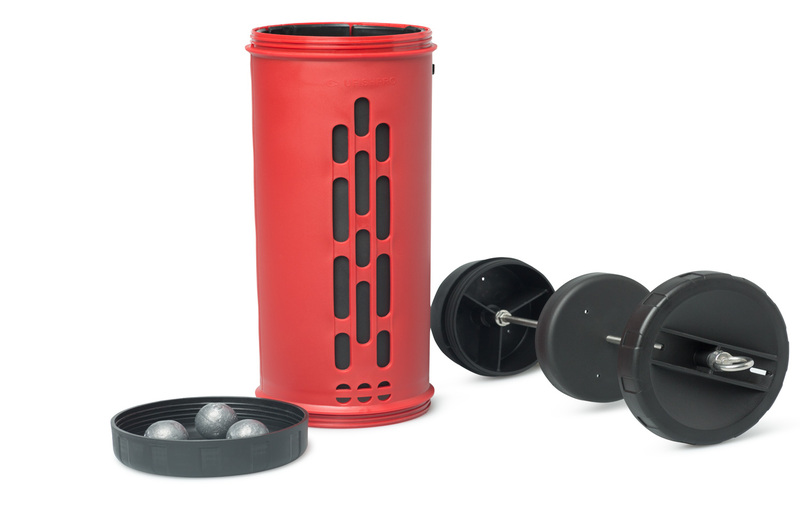 • Open the closable container’s cap (4), put in the weights*, and close it. • Fill the inner compartment with paste (9). • Make sure the top cap is properly closed (7). • Attach one end of the string* to the chum dispenser’s eyebolt (6) and the other end of the string to one side of the boat. • Use the adjustment lever (10) to set the desired opening (3). 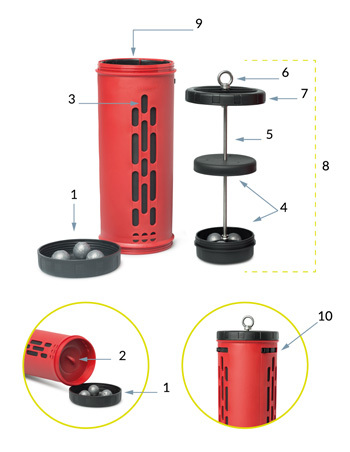 • Drop the chum dispenser into the water, and lower it to the same depth as the hooks. * Weights, lead, and rope not included. You can pay safely with a credit/debit card, or by using the PayPal system. Are shipping costs the same if I purchase more than one chum dispenser? No, shipping is not the same if you purchase more than one chum dispenser in the same order. Check the following table to see shipping expenses according to the number of products. You can find more information in the Shipping Cost section. Can I purchase an UFISHPRO chum dispenser if I live in another part of the world? If your location does not appear as an option when placing an order through the online shop, send us your request via e-mail to info@ufishpro.com. What if the product is defective when it arrives? If you receive a damaged package, you should notify the shipping company immediately. Once you receive your order, you have 24 hours to check that all components are included and are in perfect condition, and report any incident. Once this timeframe has lapsed, the order will be considered to be accepted. How can I find out more about the UFISHPRO chum dispenser? Si quieres saber más, If you want to learn more, check out the UFISHPRO chum dispenser Q&A section.